VVOC-1's interface looks simple and - of course - suitably vintage. 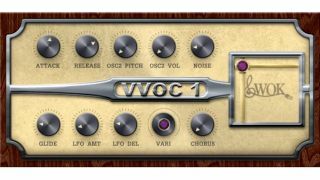 WOK has expanded its free VST plugin offering with the launch of VVOC-1, a vocal synth. Designed for producing voice sounds with a "vintage electronic touch", it promises to be particularly adept at generating synthetic choir tones. There's an integrated chorus effect, and you can use an XY pad to select formants. A pitch glide function is onboard, too, and - somewhat cryptically - WOK mentions a "hidden secret" that can "unveil more power than the easy GUI might imply". VVOC-1 is available for Windows only, and can be downloaded from the WOK website.